Power and utilities have yet to fully adopt blockchain technology. Find out how energy providers and consumers alike could benefit. As an ex-CIO in the power and utilities sector, I’m always interested in the rise of new technologies – especially when they have the potential to reshape the future. What has my attention now? Blockchain. This technology – in its simplest form, a public ledger that records transactions – promises to radically speed up transactions and cut costs by facilitating a trusted transfer of value without the involvement of traditional intermediaries. Already widely used in the financial services sector, a growing number of industries are experimenting with the technology. Blockchain wouldn’t be the first technology to unhinge the sector. Technological breakthroughs in panel efficiencies have seen solar costs fall by 80% over the last three years and they’re set to fall further. Advances in battery storage technology now mean households can store electricity for back up or load shifting, allowing for greater flexibility to buy and store electricity when rates are low, and consume it as needed. Alongside the rollout of smart meters and continued development of demand side response measures, new digital peer-to-peer platforms are starting to emerge that cut out the middle man and seamlessly connect green energy producers directly with those wanting it. What we are witnessing is a power shift – the advent of an energy sharing economy. These changes are empowering consumers to take control of their energy usage and reduce energy bills. It is these changing characteristics that are exciting the blockchain community. They are drawn by the growing complex web of transactions, the need to balance the geographical mismatch between supply and demand, and significant security and trust concerns given the proliferation in IoT connected devices. A new ecosystem of energy blockchain start-ups is emerging, and venture capital, so far, has raised over US$1b to scale business models of the future. Aside from some early demonstrations, the applicability of an energy blockchain is largely theoretical. The ability to support a globally connected network of energy transfer, where smart devices will be able to securely send and receive data while autonomously reacting to market signals, is a reality some believe is still 5-10 years away. Smart meter rollout programs are in their infancy, huge investment is needed to digitize the grid, and global battery storage totals in the megawatts rather than gigawatts. A new ecosystem of energy blockchain start-ups is emerging, and venture capital, so far, has raised over US$1b to scale business models of the future. Over 100 blockchain use cases have been identified. Most pilots are still in early stages across the energy value chain, primarily in the area of peer-to-peer energy trading, where owners of small-scale generation can sell excess generation direct to other consumers. These pilots range from microgrids and solar systems to e-mobility and EV-charging. Other potential applications include authenticating renewables at the point of origin or keeping a record of emissions’ permits. Many are also considering its application as a grid management tool that can record energy flows to highlight anomalies in the network. But, according to a Navigant Research report, peer-to-peer energy trading is the use case that is gaining most traction. This is being made possible by the ability to pre-program “smart contracts” that can trigger transactions automatically. These smart contracts can be set to allow prosumers to feed surplus energy into the grid through a blockchain-enabled meter. The flow of electricity is automatically coded into the blockchain and algorithms match buyers and sellers in real time based on preferences. Smart contracts then execute when electricity is delivered, triggering payment from buyer to seller. Removing financial transactions and the execution of contractual commitments from central control brings a whole new level of decentralization and transparency that the industry has never had before. In April 2016, residents in Brooklyn, New York, successfully traded renewable energy using a smart contract on the public Ethereum Blockchain platform enhancing trust and visibility amongst participants. 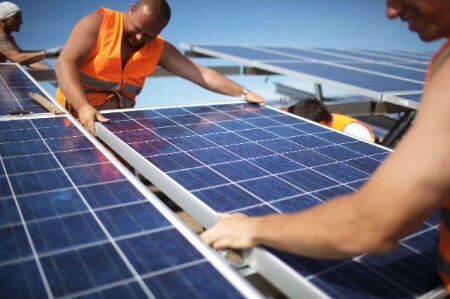 In Australia, several pilots are underway that will allow residents in Perth and Southern Western Australia to buy, sell or swap excess solar energy with anyone connected to the Western Power network. These provide an exciting glimpse into the future of energy blockchain. But there is a big difference between trading a few spare kilowatt hours between neighbors across a street and a truly autonomous energy system automatically balancing supply and demand, and transacting against a set of pre-coded algorithms. Outside of the bitcoin application there is a lack of proven use cases, and difficulties with security, scalability and frequency for transactions are factors that need to be overcome. In three to five years’ time, it is quite possible that blockchain will radically change the way parts of the industry operate. To get there, blockchain must overcome competition from existing solutions and prove its attractiveness to users. Only if its applications have tangible, monetary, or timely advantages, will blockchain be able convince enough participants to ditch their legacy systems for this new platform. While the hype might be real, establishing itself as a credible alternative is the biggest hurdle that blockchain needs to overcome. An energy blockchain can be a catalyst for business model and process change right across the enterprise. It could be instrumental to manage the sector’s growing complexity, data security, and ownership. It is essential therefore that utility CIOs and business leaders understand the role that blockchain can play. Doing proof of concepts, and implementing small-scale tactical deployments which solve actual business needs are as much about the lessons learned as the value delivered. Understanding how the next generation distributed ledger technology may evolve, and the business models that might be enabled, are a next step. Much as the telecom revolution and the invention of mobile phones and smartphones have reduced the reliance on landlines and phone networks, blockchain technology could revolutionize how the power sector works. Utilities need to decide what part they want to play. Access more insight on the impact of blockchain technology on the energy sector from Thierry Mortier, our Global Power & Utilities Innovation Leader. Thierry recently attended the EY-sponsored Global Summit on Blockchain Technology in the Energy Sector in February 2017. Companies across many industries will benefit from the blockchain revolution. Ask yourself how your company could prepare.